The facility developed on a 18-acre site comprises 4 production buildings and a Pilot Plant. The production buildings have finished product areas for APIs with clean air, purified water systems that operate under full cGMP as per ICH guidelines. It has cooling services, brine, cool water, heating with thermal oil or steam, 100% standby power, warehouses & bulk solvent storage tank farms. The facility is included with environmental friendly Vapour Absorption system for chilling applications. Nitrogen Generation facility is available. There is a process R&D Laboratory and a well-equipped Quality Control laboratory and an elaborate Quality Assurance and training center. Modernized effluent treatment plant (ETP) with latest equipment like Gas Incinerators, evaporators, etc., handles liquid effluents and treats them chemically to the specified standards. 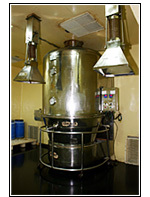 Incineration is available to treat solids. The company has a well-equipped and modern laboratory capable of handling all the testing required for analysis of APIs and Intermediates. The QA department is proficient in all the aspects of system designing and maintenance needed for a cGMP facility. The QA/QC team is lead by a group of talented professionals. We at Saraca Laboratories Limited are committed to prevention of pollution and improvement of environmental performance. We are also committed to create a safer and healthier environment to all our employees. In an endeavor to achieve this, we implement the state-of-the-art technologies to strictly comply with various statutory norms from time to time. Our EHS team promulgates the concept of sustainable development among all the employees and creates a congenial work atmosphere.